As a salesperson, it is essential that you know the best ways to engage with your leads, prospects, and contacts. For a better response from your contacts and prospects, write more powerful and personalized content by combining emails with contextual CRM information and analytics. When most of your day is spent in CRM, it is vital to know if any of your prospects have responded to your emails. Get immediate alerts from deals and contacts that are most relevant to you, right inside Zoho CRM. Reply instantly to emails, add follow-ups, and make notes when needed. Don't let emails fall through the cracks. Take advantage of Zoho CRM's reports that show when your emails were delivered, if they've been opened and when they were read. And, since Zoho CRM associates all emails with their respective customer records, you'll never have to comb through a mountain of messages to send your next round of follow-ups. Filter your emails according to their status. Plan your follow-ups strategically and identify leads who haven't responded within a certain time frame with advanced filters. Templates are a quick, easy way to free yourself from the tedium of drafting emails. Design a template to match your style, or choose from our gallery of handpicked templates, and customize them. Use the template editor to drag and drop elements, such as text, images, tables, and columns, into any position you like. Identify the emails that work best. Reports let you know exactly which email templates had the best open rates and which ones failed to click. Select from the ones with the highest open rates, update the content in your existing templates, or create new versions altogether. Share the revised templates with your colleagues. A manager needs to know who is performing and who has room to improve. Use Zoho CRM's analytics about each salesperson's account to create individual reports based on the number of emails they've sent on a daily, weekly, or monthly basis. With the Zoho SalesInbox integration, bring your email inbox inside CRM. 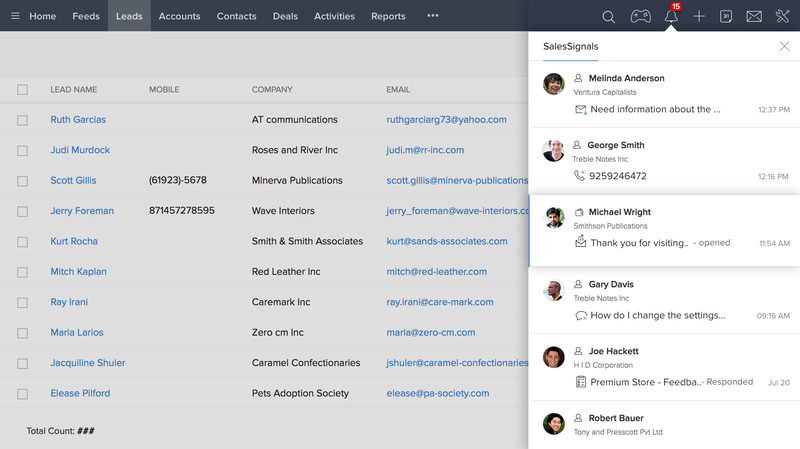 Regardless of which email client you use, SalesInbox organizes your messages according to the CRM pipeline, so you stay on top of the deals that matter most. Drag-drop emails across the columns to add contacts or create deals. Get real-time notifications when recipients have opened your emails, and set reminders to follow up again when you haven't heard back. Compatible with your favorite email system. Send and receive emails from the email client of your choice, including Gmail, Yahoo!, Outlook, and Zoho Mail, so that you never miss a message. 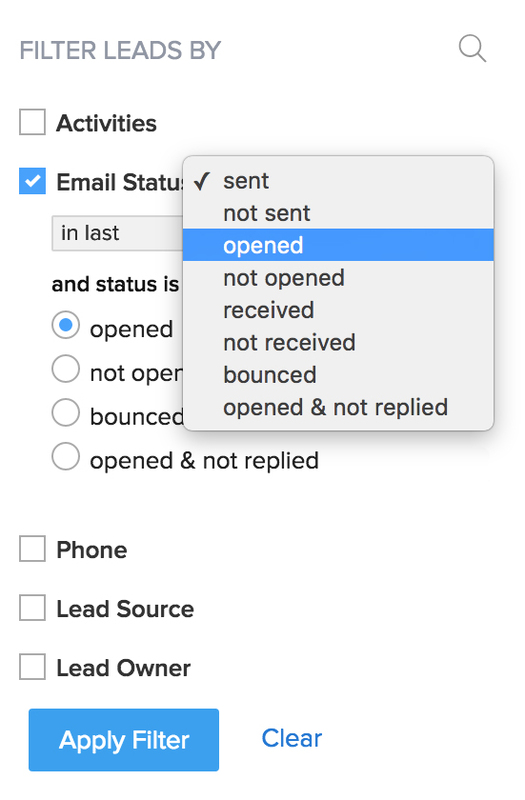 Use the standard email configuration to link all incoming emails to your CRM. Integrate your CRM account with Zoho Campaigns to send bulk emails to your leads, contacts or prospects. Initiate mass email campaigns, analyze their performance with reports on the open and click rates, and import all leads and contacts from Zoho Campaigns to Zoho CRM.